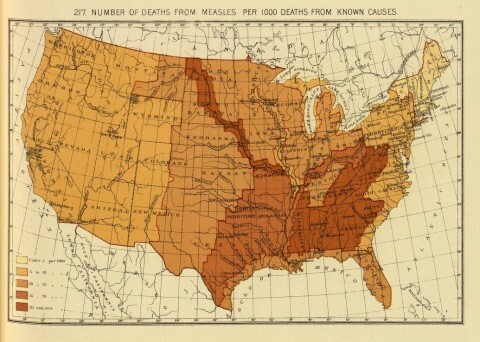 This week, Rebecca Onion's always interesting blog on Slate features historical maps that illustrate the toll measles took on America before the advent of vaccines. The map above brings you back to 1890, when measles-related deaths were concentrated in the South and the Midwest. That year, according to the U.S. census, 8,666 people died from the disease. Fast forward to the period moving from 1912 to 1916, and you'll find that there were 53,00 measles-related deaths in the US. America continued to struggle with the disease, until 1962, when scientists mercifully invented a vaccine, and the rate of measles infections and deaths began to plummet. The authors of "Measles Elimination in the United States," published in The Journal of Infectious Diseases (2004), note that "Since 1997, the reported annual incidence [of measles] has been <1 case/1 million population" -- meaning that the disease had been pretty much eradicated in the US. But not elsewhere. The authors go on to warn, "Measles is the greatest vaccine-preventable killer of children in the world today and the eighth leading cause of death among persons of all ages worldwide." It doesn't take much to deduce that if we dismiss the science that has served us so well, we could see dreadfully colored maps all over again. Except this time the dark orange will likely be concentrated on the left coast. Find more historical maps on Slate.